[/colour][colour=#ff4080]Fluttershy awoke to a gentle, yet insistent tapping between her ears. Blinking in the darkness, she looked up to see a bat hanging upside-down from her bed's headboard, tapping her with a wing. "Mmm... Mister Bat? What's wrong?" she asked the creature in confusion. The bat gestured toward the wall of the bedroom, where a clock hung. The light from the moon illuminated the face, showing that it was 5:00 in the morning. With an up-side down nod and a yawn, the bat flapped off to a small open window, then flew off to his daytime roost. She made her way to a basket on the floor, and nudged it with a hoof. The rabbit in the basket opened one eye to look up at the yellow pegasus, then closed the eye again before pulling his blanket up over his head. Fluttershy bent down to the basket, nudging the bunny with her nose. "Now come on Angel Bunny," she said, still keeping her voice low. "It's time to get up. You promised that you would help me today!" Angel sighed reluctantly, and sat up. One ear was flopped down over his eye, while the other was draped down the side of his face. With a shake of his head, both of his ears finally perked back up. 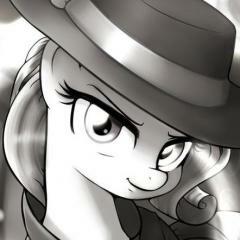 Fluttershy smiled, and gestured for Angel to follow her. The pair quietly descended into the kitchen. Fluttershy put a kettle of water on her stove to make some tea. She'd gotten this particular blend from Rarity. It was something the unicorn drank when she was working late nights at her shop. Fluttershy thought she might need the pick-me-up to get through all the things she had to do today. Angel, meanwhile, was preparing some fresh fruit for the pegasus, while munching on a carrot himself. When the bunny and pegasus were done eating, they headed outside. It was still dark, but a bright autumn moon lit up the ground. Fluttershy hoped that by getting started this early, she be able to get all of her jobs done, as well as her normal rounds with the sick and injured animals in her care. She had donned her "Animal Team" vest from Winter Wrap-up, and Angel was riding between her wings. When Fluttershy looked at the moon-lit ground, she saw what looked like several balls of fur. Upon closer inspection, the fur balls turned out to be a family of moles. The moles gathered around her as she approached. "Good morning, Mr. and Mrs. Mole!" she said brightly to the two largest moles, who waved in greeting. "And how is Junior's leg today?" One of the smaller moles stepped forward to show off his healed hid leg, then did a little back flip. Fluttershy giggled at him. "Well, that's good to hear!" she told the younger mole. "And thank all of you so much for coming out and helping this morning," she told the group. "We need to make sure that all of the hibernation dens are ready for the winter, and that none of then were damaged over the summer. Can you all help me with that?" [colour=#000000]Everypony in Ponyville got excited come Winter Wrap Up time. It was a big deal, and every single pony was needed to get the big job of clearing the winter done. The change from autumn to winter, however, was not one that brought with it quite as much excitement and anticipation. That was, of course, unless you happened to be a weather pony like Cloudchaser. There was a lot of work that went to it. It wasn't as simple as just making all your rain clouds drop snow instead. [/colour]Snow had to be produced in the weather factories in Cloudsdale and brought in. Clouds had to be adjusted, wind patterns set, temperatures dropped and on top of it all they had to make sure everything was ready for it before they dropped the snow. It was a lot to keep track of, and especially so for a relatively simple, carefree mare like Cloudchaser. Still, she did as told and did her best and progress was slowly made. Before long, with all of their hard work, Ponyville would be ready for the first snow of the year. The Wonderbolt was in the small town of Ponyvile, he had heard that they were setting up for winter and figured he could lend a helping hoof or two, the only part of his normal WonderBolt get up were his goggles since he had sorta decided to show off on the way here...though he had come alone so whom he was showing off to was anyponys guess really! Once he was close enough he did a sharp landing, though nearly bumped into two very pretty ponies that he coulda sworn he seen before. The first one was a adorable yellow pony, with deep soft eyes, and a cute pink mane that practically framed her face with a heart, she was so sweet that he was sure that if her hoof touched the snow it would start to dissolve! And the second one was a mix of soft purple, and a white and light blue fluffy mane! It was over the top, and she seemed like an over the top gal, just like Gale he bet she stuck herself in situations where trouble was bound to happen! This was going to be fun, he could feeeeeeeeeeel it! It was that time of the year again, time where Luna's night would dominate and the shortened days grew colder, but it was also the time of festivals, including the wondrous Hearth Warming Day. Of course everything had to be prepared for the winter season; the snowflakes had to be finished and ready to go, the clouds prepared for their delivery, the last of the leaves cleaned up, and of course, making sure the animals are ready, especially those who hibernated. It was that latter job that Flitter was assigned to helping with, her first time signing up too! Sure, she was a pegasus, but she had far more interest in the living creatures of the world then the clouds of the sky - that was more her love, Cloudchaser's expertise. Flitter flew towards the meeting location in a rather lazy S pattern, convinced she was actually early. It was quite nippy out that morning, the sun yet to rise over the horizon, although the first light of dawn had already illuminated the sky into a dark blue. Flitter was ready though, adorned with a warm scarf of bright lavender and periwinkle and thick leg warmers to match, her saddlebags stuffed with all the necessities: Food, warm gear for Cloudchaser, and most importantly, her papers and pencils! She was determined to figure out how Fluttershy had such a natural, deep connection to the animals, it would definitely help with her research paper! It didn't take long to reach the pre-arranged spot, Fluttershy was already there, as was Cloudchaser! Score! As well as a blue pegasus stallion with a midnight blue mane whom she didn't recognize, but somehow looked familiar. That's alright, of course there would be plenty of other ponies to help and she didn't think they would really interfere with her research goal. [colour=#ff4080] "T-that's OK," Fluttershy murmured, acknowledging the apology. At Flitter's explanation, Fluttershy looked up to the clouds. Even at this early hour, she could tell they were a bit thicker and more grey than they were when she had gone to sleep. "Oh, I see!" she said to the other mare, brightening a bit. "I can see how that would be a lot of work!" She wasn't a weather pony herself, of course, but she had grown up in Cloudsdale, and living in that city could give anypony an idea of the work that went into making Equestria's weather. "My friend Rainbow Dash always complains about the extra work when the seasons are changing," she added with a bit of a smile. "Oh goodness glaciers! A thousand apologies my fair maidens! Names Gale, I'm here to help you pegasi set up for winter in any way, shape, or form... and who might you two visions of radiance be?" [colour=#ff4080]The blue stallion was wearing flight goggles, and bowed as he gave his apology. Just as Fluttershy was finally opening up, Gale's arrival sent her into fright again, and then immediately into embarrassment at his compliments. Her checks began glowing pink, and she ducked her face back behind her mane to avoid eye contact with the stallion. "I-I'm... um... Fluttershy and, um..." she answered, her voice fading until it was nearly inaudible. Then, Fluttershy realized what the stallion had actually said. "You... you're here to help?" she asked, a bit of hope creeping into her tone. The preparations for winter weren't as extensive as Winter Wrap Up, on the ground at least. The Running of the Leaves had taken care of the trees, the farmer ponies already had their crops harvested, and the pegasus weather teams were changing the temperature and cloud cover. With so much already done, ponies sometimes forgot that the animals also needed help getting ready. So anypony volunteering to help made everything just that much easier. "That would be wonderful!" she told Gale in a soft tone. Looking around, she saw that many of the migratory birds has awoken in the area. The glanced back to the blue stallion. "Um, maybe you could help the birds exercise their wings?" she asked, then quickly added, "If you don't mind, that is..."
"T-that's OK. Oh, I see! I can see how that would be a lot of work! My friend Rainbow Dash always complains about the extra work when the seasons are changing,"
"Oh goodness glaciers! A thousand apologies my fair maidens! Names Gale, I'm here to help you pegasi set up for winter in any way , shape, or form...and who might you two visions of radiance be?" "Um, you want to research what?" He chuckled at that "Yes I'd love to help the birds exercise their wings" He nodded "Anything to help out Ponyville! It's truly a pleasure to meet the both of you" He glanced at the pony that asked him if he was from around here and he shook his head "No Ma'am I'm from Cloudsdale! Gale Flurry is the name" He bowed then, the sight that unfolded was amusing, and the hyperactive pony's antics were amusing,....though at CloudChasters question he couldn't help but grin lightly "They came with the WonderBolts uniform, I woulda worn it today but it felt too show offy and really I just want to help out" He nodded, putting a hoof on her shoulder . "Now now don't doubt yourself like that! I'm sure you'll get in " he winked at her "I 'm sure you'll ace the Academy with flying colours too, you seem like a good flier"
He moved a hoof up to adjust his goggles then, making sure they were straight. Flitter was about to go into detail to how this actually concerned her wanting to study Fluttershy when the dashing blue pegasus stallion mentioned he was a Wonderbolt! It suddenly dawned on Flitter that where she had seen him before. At the shows! [colour=#cc99ff]“Ohhh woooooooow!! I so didn’t know who you were at first; you’re Gale Flurry! Look Cloudchaser its Gale Flurry! !”[/colour] Flitter wasn’t a Wonderbolt enthusiast like Dash or Cloudchaser, but to her they were the definition of cool so it was no surprise to her that Gale then practically endorsed Cloudchaser as wonderbolt material! [colour=#cc99ff]“I told ya Cloudchaser!”[/colour] Flitter smiled confidently, [colour=#cc99ff]“she is so totally Wonderbolt material; I know she’ll breeze right through the academy! Oh! Since you’re here, she can gets some extra pointers!” [/colour]That may have been a little too much to ask, but Flitter was running on pure enthusiasm. Bramble Rose hurried around his tiny upstairs apartment, trying to get everything together. He'd meant to leave earlier, to get everything together, but last night's photo shoot had gone long. Very long. Glitzen's artistic muse tended to perfectionism at time, but Bramble didn't mind. Too much. It gave him the bits he needed to save away something for travel, and that meant the most to him. But then he'd needed to check the greenhouses for Lily, and then he'd overslept, and he'd never even gotten to get his notes together! He raced around his room, stuffing papers and notebooks into his bag, anything that seemed like he might need them. Bramble had helped with the Running of the Leaves, and with the Winter Wrapup, both of which had to do with his specialty - flora. This, though, had to do with fauna - a subject he'd had a few more problems with in college, and which old Hoss back at the university had suggested he might want to flesh out his research with. He'd gotten only two papers published since he'd graduated, and he really needed a more active academic presence - expanding the scope of his ongoing research would certainly help! He threw the heavy saddlebags on, grabbed the scarf in his teeth and whipped it round his neck, grabbed his hat with his magic and shoved it over his head, hopped into his boots, and hurried out the door. [colour=#808080]"See you later, Lily, kids! "[/colour] he called to his boss. [colour=#808080]"I'll check greenhouse three tonight! "[/colour] Then he was running all the way to the meeting place. The delicate little unicorn arrived panting, even smaller than any of the mares here. His green hat, marked with snowflakes in silver thread, was matched by his scarf in the same colours. Three of his boots were simple green, as well, which went well with his purple coat, but his left rear boot was pink and topped with a white fluff - though he hadn't realized that he'd accidentally put on one of Lily's boots, yet. His long silver mane tumbled out of his hat a little messily, and papers stuck out of every crack of his overstuffed saddlebags. [colour=#808080]"Ah... ahh... sorry ... I'm late! "[/colour] he panted. [colour=#808080]"Bramble Rose, reporting for duty! I didn't know ... what notes I'd need! I'm a little... behind in my ... fauna research ... and I want to ... be able to help ... as much as I can! "[/colour] He looked around in surprise ... this was for setting up for animal-care, right? He'd been expecting mostly earth ponies, but there were so many pegasi here! Excellent! This would be perfect! [colour=#ff4080]Fluttershy just smiled at Cloudchaser's comments. She didn't want to embarrass the mare, but she'd seen that look on other ponies who were fans of Rainbow Dash. It was no secret that there were many ponies in Ponyville that admired Dash; There was even a rumor that some of the fillies and colts in the town had formed a 'Rainbow Dash Fan Club.' Cloudchaser had that same look in her eye when she talked about the head of the weather team. At this point, the white bunny on Fluttershy's back had had enough. He recognized the signs of an oncoming panic attack from his mistress, and resolved to put a stop to that. He hopped to the top of Fluttershy's head, and thumped one of his back feet to get her attention. When the pegasus turned her eyes up to him, he folded his front paws and looked down at her, tapping a foot in impatience. "No Ma'am I'm from Cloudsdale! Gale Flurry is the name. They came with the WonderBolts uniform, I woulda worn it today but it felt too show offy and really I just want to help out! Now now don't doubt yourself like that! I'm sure you'll get in. I 'm sure you'll ace the Academy with flying colours too, you seem like a good flier"
He felt a little overwhelmed momentarily since now everypony knew what his job was, though his ears raised clean up and turned forward at Fluttershy asking if he was sure ! He moved to take her hoof then and planted a gentle kiss on the top of it "My dear Fluttershy it will be an honor to help your town and your beautiful birds!" he said and grinned winking "Don't worry about it It will be nothing but an utter and absolute joy"
Flitter pranced in place on all fours, giggling with glee, she was sure that when the university received her dissertation proposal, that they'd be very impressed! maybe Fluttershy would even consent to be a participant in her ongoing research! She wouldn't mind would she? Of course she wouldn't! As another unicorn came trotting up, Flitter thought a unicorn mare was joining their group - but looking closer, she was sure the magenta pony was a stallion. Well, pretty sure. The lavender mare elbowed her spiky maned marefirend as she tilted her head towards the unicorn while she worked to not laugh out loud at the fact he was wearing a filly's boot on his left hind leg. Fliter couldn't help herself though,[colour=#cc99ff] "nice boots! I especially like the rear- wait… Did you say fauna research?! "[/colour] Suddenly everything changed. Was he there to write a thesis proposal?! Oh Celestia, some other pony had the same idea she did! This wasn't good, this wasn't good at all! From his vantage point atop Fluttershy's head, Angel glared down at the blue pegasus. He gestured first at his eyes, then pointed at Gale, as if to say "I'm watching you, pal!" "I tell you what, after we get all this wrapped up and delt with, I'll stay around town for a bit and give you some pointers m'self okay? Maybe we can go for a flight? If you are interested ofcourse, "
Flitter was about to make some sarcastic remark in regards to the purple unicorn's ignorance of his boot faux pas when he complimented her on her own clothes. Flitter wasn't used to that, other ponies occasionally referring to her accessory choices as "dorky" or even "foalish", especially when it came to her insistence in wearing a bow in her mane. "Oh!" Flitter looked down at her leg warmers, "do you really like them? Thanks, they're.."
Before Flitter could even finish her sentence, the poor unicorn tripped over himself. At first Flitter just snickered, but stopped herself and took a hold of the purple unicorn's hoof and helped him up as he told her his name,[colour=#ff99cc] [/colour][colour=#9999cc]"You alright? I'm Flitter by the way, and this is… Oh no! Your papers!! "[/colour] Without hesitation Flitter flew up and quickly grabbed the individual sheets of paper that shot out of Bramble's bag when he tripped, knowing the experience all too well of losing track of one's papers outdoors. Of course the lavender pegasus couldn't help but that a quick peek at the contents of the papers she was now holding, it was definitely a research paper, it even had some of the actual formulas written out, familiar ones actually… Flitter had read this before!! It was a one of the science papers she used as a footnote once for a project for school! Wait.. Was he? Could he? Flitter was so excited in the moment so almost totally forgot why she was even there to begin with, or that Fluttershy addressed her, and wouldn't have until Cloudchaser spoke up and playfully reminded her about being good to Fluttershy. Flitter saluted, as she gave a mocked serious look in Cloudchaser's direction, [colour=#9999cc]"Oh right! You bet'cha! I'll be on my best behavior ma'am! You can count on me! Don't forget to get Wonderbolt advice!" [/colour]There was no doubt in Flitter's mind Gale would be happy to show some moves once he realized how awesome Cloudchaser was. [colour=#9999cc]"So umm..Fluttershy, sorry, what did you say you needed me to do again?! And don't worry, I'll totally be paying attention to your every move, er command, er request! Yeah! "[/colour] Flitter was becoming a little overexcited, after all this was working out even better than she thought! Not only did she have the perfect subject for her proposal, she had some pony who she could totally bounce the whole idea off of and maybe, just maybe, help find an adviser for her! Bramble swelled with pride. She'd heard of him! She'd used his article as reference material! She'd really heard of him! His article! Reference material! Ohmigosh ohmigosh ohmigosh ohmigosh ohmigosh! Calm down, calm down... Play it cool. "Gale is just fine Miss Fluttershy, I will be more than happy to aid you in any task that you require it in" Gale said with a slight bow of his head, eyes catching sight of Angels gesture and a soft smirk crossed his face, before glancing over at the mare that was also roped into this task, giving her a kind smile "I surely look forward to this ! Yes let's get to it" He spread his wings then, flying up, doing a bit of a loop to stretch "Those birds are in good hooves with the two of us on the job!" Gale was still a little internally flustered at Fluttershy calling him the WonderBolts best storm flyer...it was true he loved to fly during a storm, he was a master at weaving through tricky weather...but she almost seemed surprised he would want to help! A WonderBolt was supposed to aid those in need! It was a duty that he was more than happy to uphold! "Miss Cloudchaser shall we be off then?" [colour=#ff4080]Fluttershy looked back and forth between her enthusiastic helpers, bewildered. Flitter had read something that the unicorn, Bramble Rose, had written, and had used it in her own paper. Fluttershy understood that part, but the subject they were discussing went completely over her head. She felt like she needed somepony to translate Flitter's scientific terms. She stared at the two science ponies for a moment, suddenly feeling inadequate. Fluttershy understood animals, but her knowledge was mostly instinctual, or learned from experience. These two ponies were smart, educated, and Bramble Rose at least seemed to be an expert in... whatever they had been talking about. Yet they said they wanted to learn from her? Fluttershy felt a strong desire to bolt back to her cottage. Only the knowledge that the animals needed her kept her hooves in place. The unicorn and the pegasus were once again looking to her for direction. Fluttershy steeled herself. "O..Ok," she began, "Many of the burrows and dens are going to be under the roots of the trees. Or, sometimes, inside the trees. We need to make sure they are all in good repair." Fluttershy relaxed just a bit, warming to her subject. She knew the creatures around Ponyville very well, and she had been helping them prepare for winter for years. "Now, some of the bigger animals like to winter in caves," she continued. "We'll just need to sweep them out, and clean them up. But some of the small animals, well, a pony is just too big to dig out the right sized den. That's why I've asked my friends the moles to help out." Fluttershy gestured to the little family of diggers. The moles had nervously moved away when so many ponies had started arriving, but they came forward again at Fluttershy's coaxing. The yellow pegasus kneeled down to get closer to the moles. "Don't worry, my friends, there's no reason to be scared!" she said to them, soothingly. "These ponies are here to help! Now, are you ready to go?" Flitter waved to Cloudchaser as her partner zipped up into the air to join the blue Wonderbolt. Hopefully the spikey maned pegasus will come back with some cool new tips or tricks to show off. Flitter enjoyed those, she could never do most of them herself, but watching Cloudcahser demonstrate her latest aerial acrobatics always made Flitter’s day. Perhaps even more exciting was that not only had actually met one of the university scientists who she cited in her senior thesis back in Canterlot University; but that he was genuinely interested in hearing in what she had used of his! [colour=#cc99cc] “Oh! Well, what I used of yours for my thesis was the paper you wrote about aetheric dissonance and how it relates to social clustering, it was really amazing!” [/colour] Flitter was so happy about sharing that tidbit, she buzzed a few feet into the air. Why not share the awesomeness of this moment with Fluttershy though? Flitter quickly turned to the yellow pegasus mare with glee, [colour=#cc99cc]“with your own submotive predispositions, I bet you’d really find his article on nonfocused discharge techniques and the agency of carrier reverberance to be fascinating!” [/colour] Flitter just smiled widely, surely Fluttershy would find that exciting, right? Of course she would! Flitter landed and gasped as she peered at Bramble more closely, realizing that she had seem the purple stallion before! [colour=#cc99cc]“Saaaay, aren’t you a clothes model as well? Yahh! You were in some issues of [/colour][colour=#cc99cc]Fashionista Today[/colour][colour=#cc99cc] as a model! Wooooow! A professor and a model! Who in Equestria would have ever though that would happen in a million years? !”[/colour] Flitter gave another huge encouraging smile, [colour=#cc99cc]“ooh! Ooh! Fluttershy here was a model too, a supermodel in fact! You can tell just by looking at her, doesn’t she looks like a model!”[/colour] It was true, most ponies who knew the shy pegasus saw her as exceptionally stunning; if Fluttershy wasn’t just so.. Well, Fluttershy, she’d be living the rich supermodel life with thousands of fawning fans over in the fanciest part of Canterlot. Bramble Rose was more than ready to talk shop with Flitter, but was rather caught up short when she recognized him from Glitzen Glamour's work. he felt a faint flush rising in his cheeks - sure, anything for a few bits to help fund his work, but it was embarassing to be Glitzen's model. Though perhaps that's because of what Glitzen kept wanting him to wear ... but Flitter was talking about suits. It was perfectly fine for a cute mare to be complimenting his looks for suits. He hadn't really met Fluttershy before, but his dam had always told him - nopony ever turned down a bit of flattery. His own cheeks were certainly still warm from Flitter's compliments.